Bring your cooking to the next level when you bake and serve in the Lastra white handled round baker. Made in Tuscany of Italian stoneware. Microwave, freezer, dishwasher and oven safe and highly resistant to chipping. 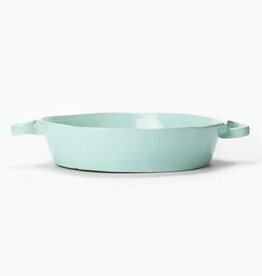 Vietri Lastra Aqua Handled Oval Baker Microvae, oven, freezer and dishwasher safe. Available in white and gray. Allow 2 - 4 weeks for items not in stock.